The XXII Olympic Winter Games in Sochi ended with a Closing Ceremony in the Fisht Olympic stadium. The ceremony, which provided a bright and emotional conclusion to the Games, was dedicated to Russian culture. 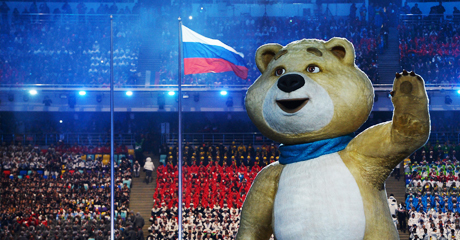 The audience was presented with a European vision of Russia, in a show directed by world-renowned director Daniele Finzi Pasca who became the screenwriter and director of the Sochi Olympics Closing Ceremony after joining the Russian team, which also included creative director Konstantin Ernst and executive producer Andrei Nasonovskiy. During the “Theater” chapter, a red and gold “Bolshoi” and a blue and gold “Mariinsky” theater appeared before the audience. 48 corps de ballet dancers were gradually joined by other characters from the Diaghilev Russian Ballet – Golden slave, Sobeide, Rose and The Dying Swan.